The Environment Agency is working in partnership with Wiltshire Council, Bradford on Avon Town Council and other organisations to investigate options for a flood alleviation scheme to reduce flood risk to Bradford on Avon from the River Avon. A drop-in session will be held on Tuesday 30th January to provide an overview of work that has been conducted so far and discuss options that are currently being considered. 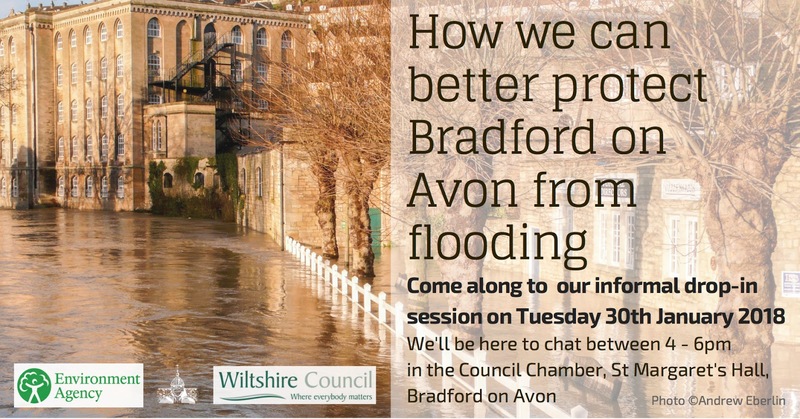 At present, no final decisions have been taken regarding future flood alleviation options. The next step of the current project will look in more detail at design options to establish if a scheme is possible. At present, a public exhibition is expected to be held in summer 2018 to share further details of the proposed scheme. Representatives from the organisations will be available to discuss queries you have about the project.